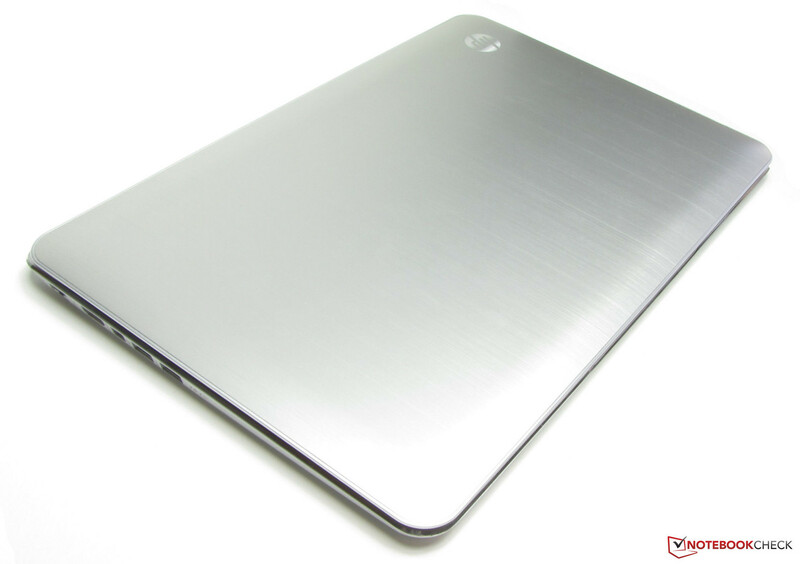 Hewlett Packard's Spectre series consists of high-end notebooks which are manufactured using both premium materials and the latest hardware. The newest member is the 15.6-inch Ultrabook Spectre XT TouchSmart. Is the combination of an aluminum/magnesium chassis, FullHD touchscreen, large and fast 256 GB Solid State Disk, and Core i5 processor a home run? All of these models are missing one important feature: the touchscreen. Aside from the recently announced Vaio T Series 15 with FullHD touchscreen, there is currently no premium 15-inch model on the market equipped as such. If it has to be a touchscreen notebook, the 13-inch Asus Zenbook Prime Touch UX31A-C4032H (Core i7-3517U, HD Graphics 4000) or the Sony Vaio SV-T1312V1ES (Core i5-3317U, HD Graphics 4000) are options. We didn't include the 14-inch Asus VivoBook S400CA-CA006H (with touchscreen) in this list, as it doesn't offer an SSD (only a conventional hard drive with SSD cache) and the build quality is also not quite as high. The Spectre XT not only looks upscale - it also feels that way. 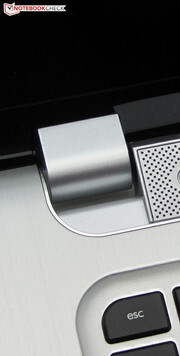 The upper part of the base unit and the back of the display lid are brushed aluminum. The bottom of the notebook is made from magnesium, which features a rubberized coating to prevent fingers from slipping. The display features a seamlessly integrated black, glossy bezel. The chassis of the Sony notebook is made out of plastic - only the back of the display lid is aluminum. The Asus Zenbook uses aluminum construction throughout. The build quality is also without major flaws: because the chassis is made from metal, the base unit resists twisting exceptionally well and doesn't respond to localized pressure much. Only around the touchpad area we noticed a bit of flex. The display lid is torsionally not quite as rigid; pressure on the back does impact the picture a bit. The hinges hold the lid in any position, but we did notice some back-and-forth movement. Because the hinges are quite stiff, one-handed opening of the lid is not possible. A magnetic lock secures the lid when the notebook is closed. The back of the display lid is made from aluminum. The 15-inch Spectre XT features a better port selection than either the UX31A or the Vaio SVT13 due to its larger size. The right side houses a third USB port, the left a Mini DisplayPort/Thunderbolt combination port. The Spectre is the only notebook in our comparison to offer Thunderbolt - a fairly new and universal interface - which allows the user to connect various devices, like displays, hard drives, printers, and cameras. At the time of this writing, the number of devices is still pretty limited, since there are not a lot of computers with Thunderbolt ports on the market. While both the Samsung 900X4C and the Zenbook UX51VZ feature a mini-VGA port, the Spectre XT is lacking VGA altogether; the MacBook Pro 15 is also equipped with Thunderbolt. Only the Vaio SV-S1511X9E still ships with a full-sized VGA port and is actually similarly configured - except for Thunderbolt, of course. Users who still need a VGA port can hook up an adapter to the HDMI port or the Mini DisplayPort (cost is around 20 Euros / ~$27). We like the fact that the ports are all located towards the back half of the notebooks, as this avoids annoying cables to the left and right of the palm rest. Left side: Gigabit Ethernet, HDMI, Mini Displayport/Thunderbolt combo port, 2x USB 3.0. Right side: card reader (SD, MMC), audio combo jack, USB 2.0, power jack, Kensington Lock. 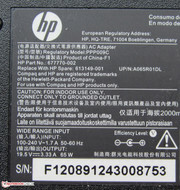 HP uses an Intel WLAN module (Centrino Advanced-N 6235), which supports standards 802.11 a/b/g/n and also includes Bluetooth 4.0. We had no issues with the reception - the signal strength indicator showed four to five bars no matter if we were really close to the router (3 meters / ~10 feet) or two floors below. The Gigabit Ethernet chip is the frequently used Realtek (RTL8168/8111). 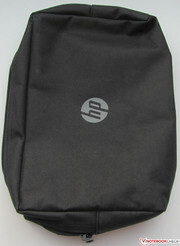 The HP Truevision HD Webcam offers a resolution of 1280x720 pixels and produces slightly grainy pictures. Aside from the common cable-based solutions, the user can connect a certified TV, monitor, or projector using Intel's Wireless Display technology. Displays and projectors without WLAN can be connected using an adapter. The necessary software to establish the connection is already preinstalled. In addition to the obligatory Kensington Lock slot, the Spectre ships with a one year subscription of Absolute Data Protect. This software allows a stolen device to be located and then to be locked remotely. The Spectre also ships with a 24-month subscription of Norton Internet Security 2013 to protect the user from Internet threats. The box includes a quickstart guide, a warranty pamphlet, a small cleaning cloth, and a pouch for the power adapter. Some software titles are also pre-installed: in addition to the already mentioned Absolute Data Protect and Norton Internet Security, the hard drive also includes Adobe Photoshop Elements 10 and Adobe Premiere Elements 10 for video editing. Cyberlink PowerDVD allows the playback of various video formats. 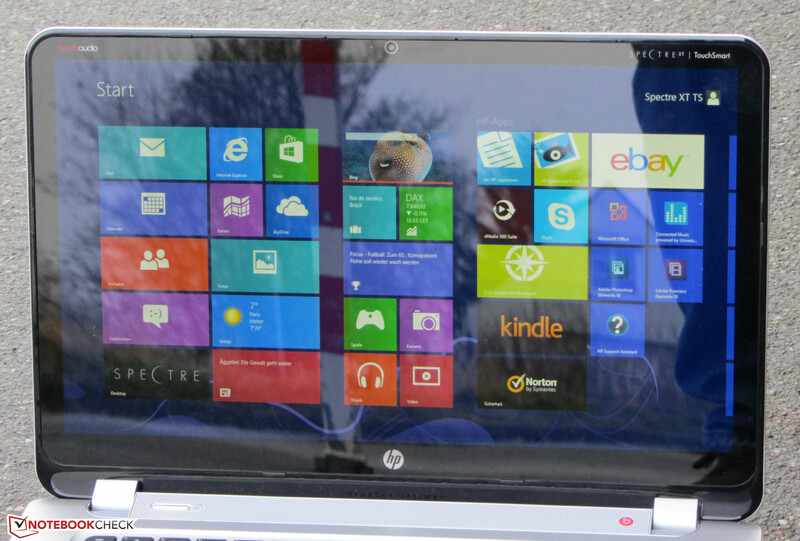 The Spectre XT ships with Windows 8 (64-bit). To restore the OS after a system crash or after a hard drive swap, the user can create his/her own recover media (either on DVDs or on a USB stick with at least 18 GB available space) using HP's Recovery Manager. To repair the preinstalled OS, the user can utilize the included recovery system, which requires pressing "F11" during start-up. 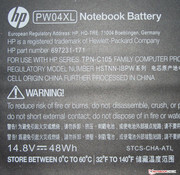 The recovery options also allow the user to reset the notebook to the factory image. The Spectre XT does not have any maintenance covers. 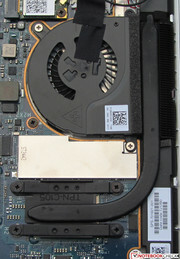 Access to the internal components requires taking off the entire bottom plate. After all screws are removed, the bottom can be taken off using a plastic putty knife - important so the notebook doesn't get scratched. Those wanting to attempt the aforementioned procedure should probably download the Maintenance and Service Guide, which details the procedure for removing various components. 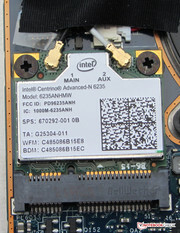 Once the cover is removed, the fan, WLAN module, BIOS battery, and the hard drive are accessible. The Spectre ships with 4 GB of RAM, which is soldered onto the motherboard. 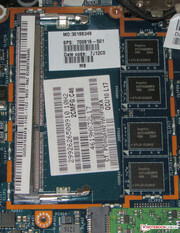 One open slot allows the RAM to be increased to a maximum of 8 GB. Both the soldered-on RAM and the open slot are covered with a heat shield, which needs to be removed first. HP only ships the XT with 4 GB of RAM - not enough, especially when one considers the price point of almost 1600 Euros (~$2150). Since the RAM only operates in single channel mode, a loss in performance is also to be expected. 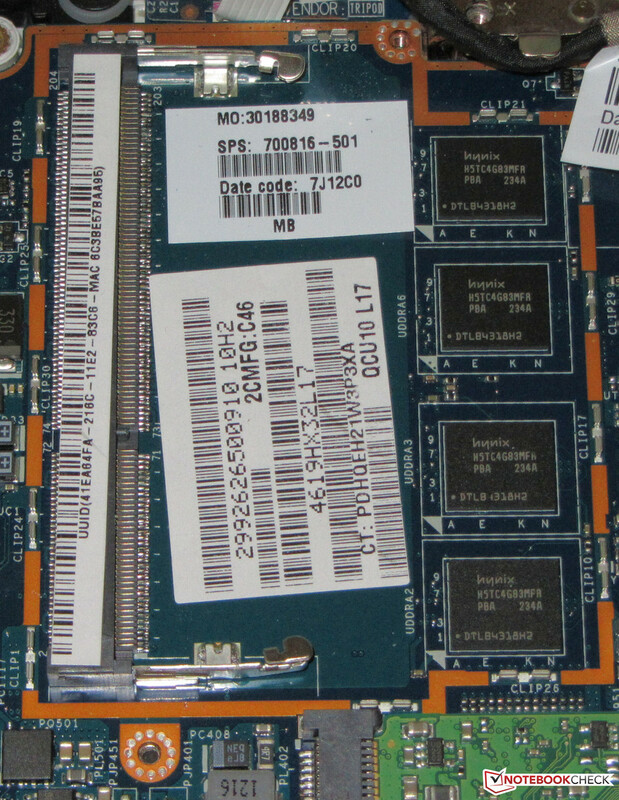 We really don't understand why HP does not include another module to allow dual channel mode - it is not fair to expect the user to take apart the notebook just to add another module. The hard drive is an mSATA model, which can be swapped out if so desired. 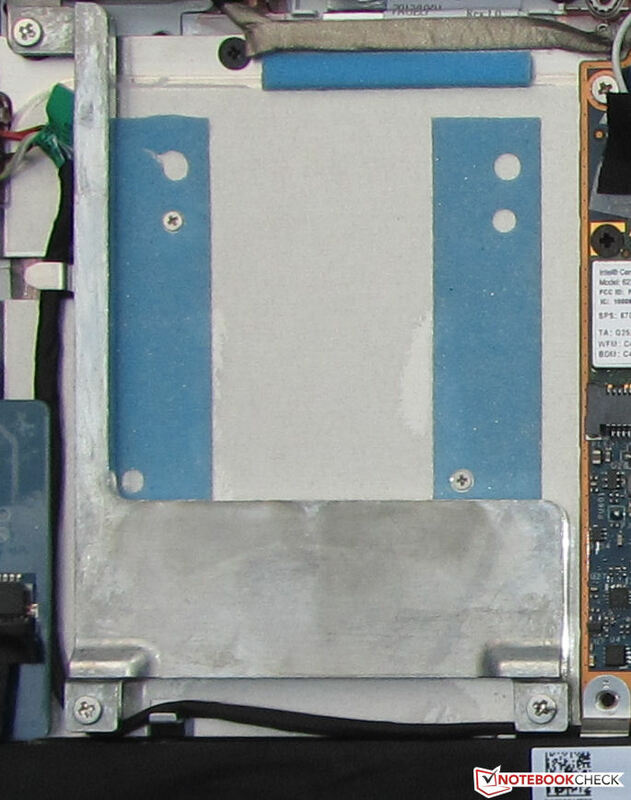 A closer look at the photo detailing the components reveals an opening for a standard 2.5-inch hard drive. The Maintenance and Service Guide outlines what steps need to be taken. In order to install the additional hard drive, the user needs to order a caddy and a cable - both are not included. This is also the reason why we couldn't test this configuration. 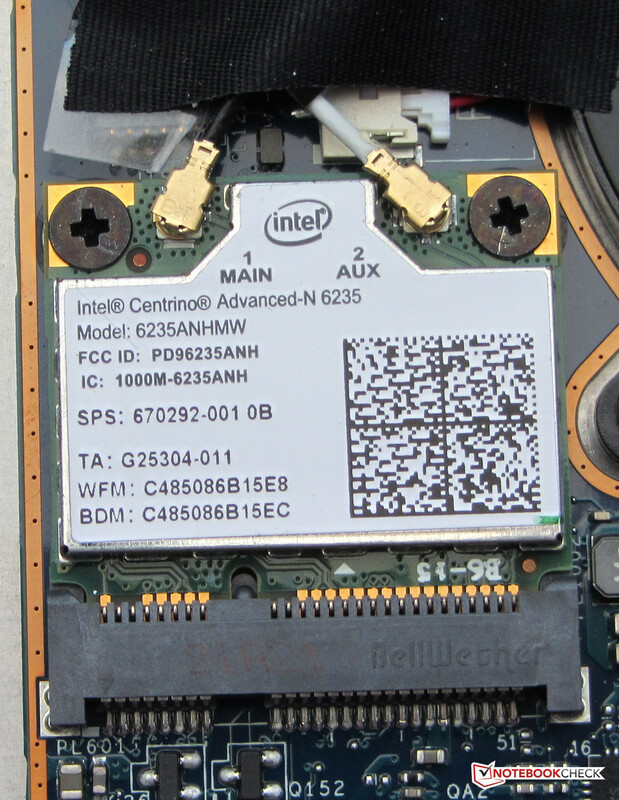 In Germany, the Spectre XT is covered with a 24-month warranty and includes pickup and return service. 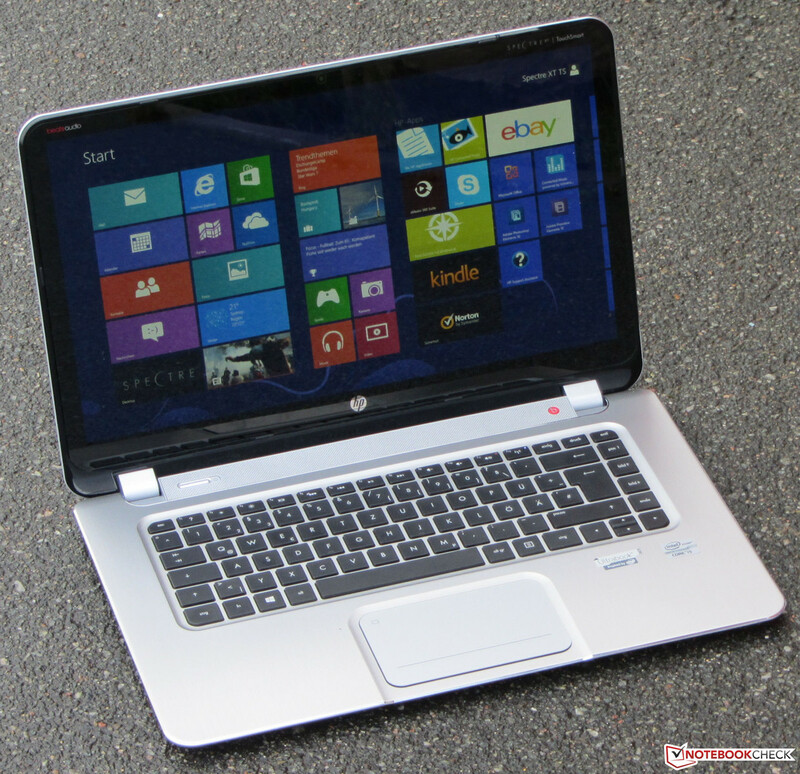 The Asus Ultrabook is covered by a similar warranty; the Sony notebook only has a 12-month warranty. 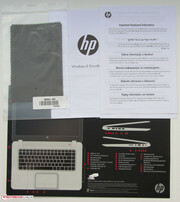 HP also offers a Care Pack for around 120 Euros (~$160), which extends the warranty to three years total. The Spectre XT features a backlit chiclet-style keyboard. The main keys measure 15 x 15 millimeters (0.59 x 0.59 inches), offer medium key travel and good feedback - although we would have preferred the keys to offer a bit more resistance. The keyboard is integrated well and does not flex. Overall we liked the typing experience. 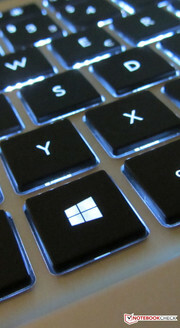 The touchpad is a multitouch-enabled clickpad. This means that there are no individual mouse buttons, but rather that the whole surface area in the bottom area is clickable. The travel is very short; the feedback good: the corresponding clicks can be both felt and heard. The size of 11.2 x 7.1 centimeters (4.41 x 2.80 inches) provides ample space for multitouch gestures. The glass surface allows fingers to glide well. The gestures can be configured in the menu - not all of them are activated by default. 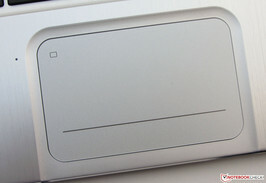 Instead of the touchpad, the user can also operate the Spectre XT using the touchscreen. We had no issues: any input is accepted quickly and without delay. The sensitivity is just about perfect - neither too sensitive nor unresponsive. We do think that the touchscreen is more of a gimmick though - holding an arm up in the air to touch the screen gets annoying quickly. The screen also bounces a bit every time it is touched. A on/off switch is located at the top left corner of the touchpad; an LED indicates activity. 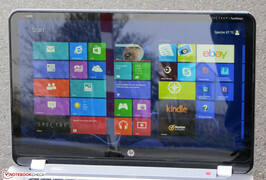 The glossy 15.6-inch display features a resolution of 1920x1080 pixels. Other displays are not offered. The Asus Zenbook also comes with a FullHD display, the Sony Vaio has a "normal" screen (1366x768). We measured an average brightness of 274.6 cd/m², which is quite good. The display of the Asus UX31A is a bit brighter (286.2 cd/m²); the Sony Ultrabook T13 can't keep up in this department (155.3 cd/m²). Considering the price point of the Sony (less than 1000 Euros / ~$1340), this is not really surprising: the TN touchscreen is the worst panel in this group. The UX51VZ (FHD), SV-S1511X9E (FHD), and the Samsung 900X4C (HD+) also come with comparably bright and vivid screens. The expensive MacBook Pro 15 Retina has an even higher resolution (2880x1800 pixels). Users wanting a matte display instead should take a look at the UX51VZ and the 900X4C. The screen produces vivid pictures. The measurements confirm our impression: the contrast ratio (800:1) and black levels (0.38 cd/m²) are both very good. The display of the Asus Ultrabook falls behind by a bit (522:1, 0.64 cd/m²); the Sony by a lot (254:1, 0.68 cd/m²). The Zenbook UX51VZ (498:1), SV-S1511X9E (555:1) and MacBook Pro 15 Retina (913:1) all offer comparable performance. The Spectre XT is not able to reproduce the colors spaces sRGB and especially AdobeRGB accurately, although yellow and red are differentiated quite well. According to our measurements (we use a photo spectrometer and CalMan software), the colors red, yellow, and cyan are only slightly above the ideal DeltaE of 2.8. Depending on the brightness, the gamma value reaches 1.7 at 10 percent brightness and the target value of 2.2 at maximum brightness. The color temperature also fluctuates slightly between 6.900 and 6.800 Kelvin depending on the brightness, which is above the ideal of 6.500 Kelvin. 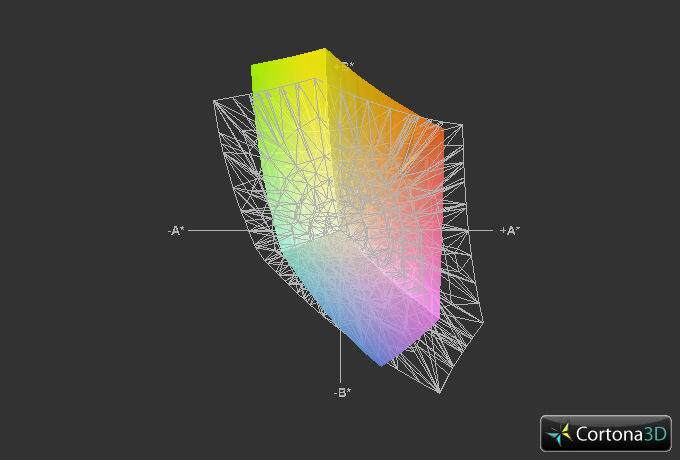 Even though the white point is pretty much exactly where it should be according to the CIE 1931 color diagram, all other colors except cyan (red and yellow are close) are way outside the ideal values. The saturation is also a little on the low side. Blue and magenta are way outside a DeltaE value of 5, although the blueish cast is not that strong (at least not when compared to some cheaper TN panels). Those who know what to look for can definitely see it though, since deviations are visible starting at a DeltaE value of 3 or more. The grayscale DeltaE is about 5.84. 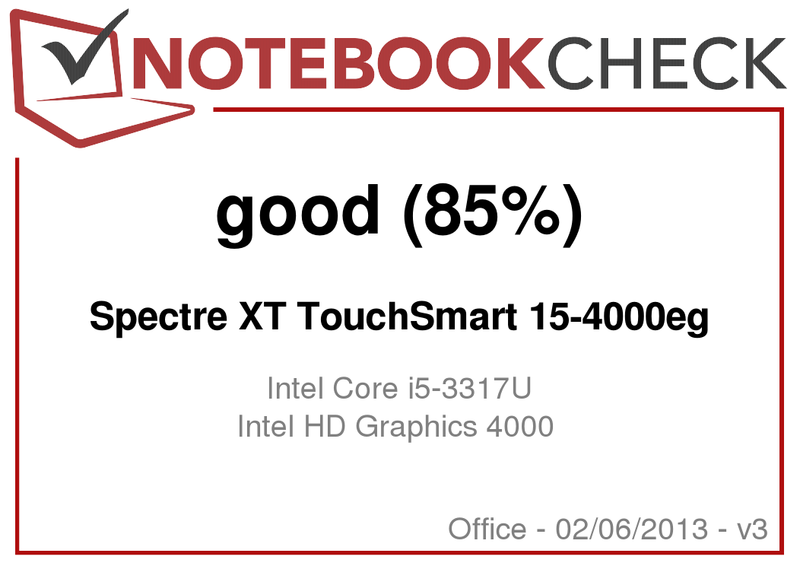 The overall results are not that great if compared to a good desktop display - but as far as notebook displays are concerned, the Spectre XT is definitely upper class. The Zenbook Prime Touch has inferior grayscale accuracy, but color accuracy is on par. 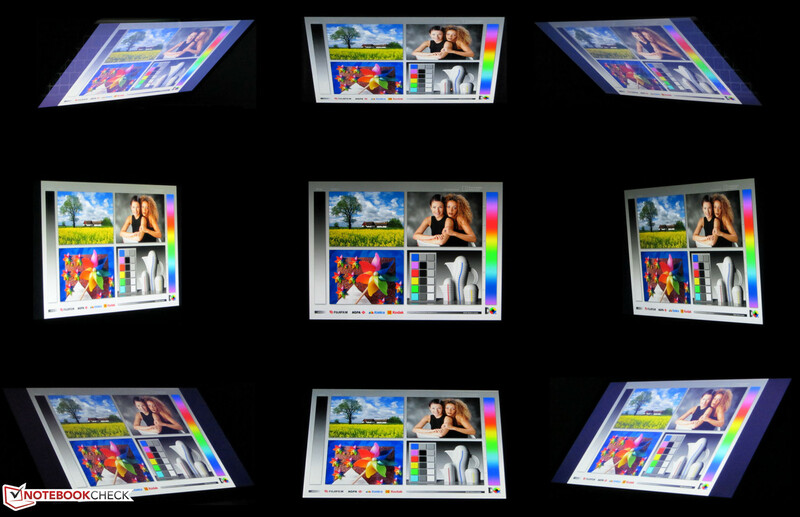 The brightness of the display is sufficient for outdoor use. As long as the display is adjusted to minimize reflections, the content is easily readable. The viewing angles also benefit from the IPS technology. No matter which angle is chosen: the picture is always near perfect. The only exception: if the user stands to either the left or the right of the display and looks down from above, the picture fades slightly. 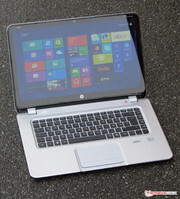 Viewing angles HP Spectre XT. 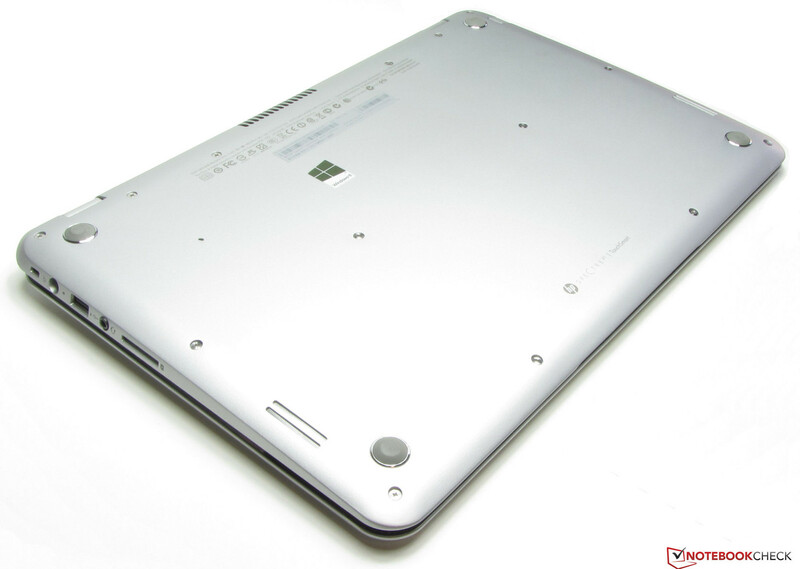 The Spectre XT is classified as a business notebook. It is more than powerful enough for Internet communication, video playback, and various office-type tasks. The high-resolution display also makes video editing and personal photo editing possible. 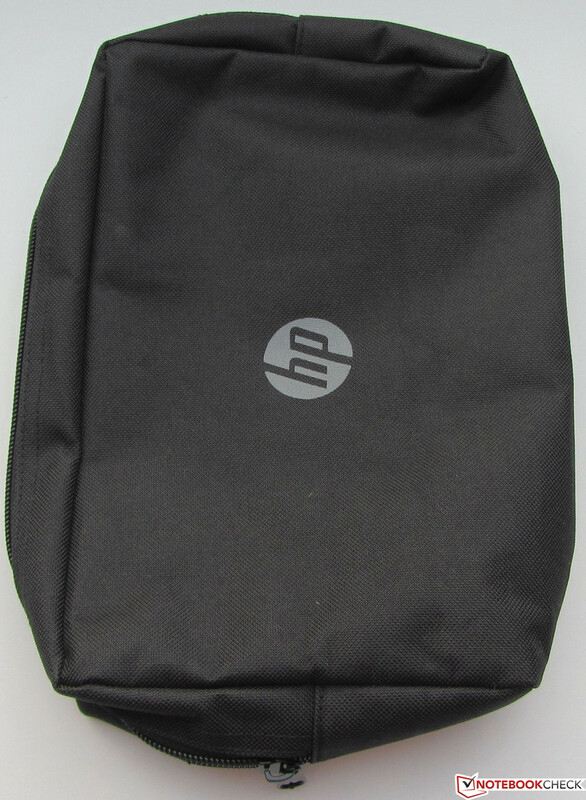 HP includes Adobe Photoshop Elements 10 and Adobe Premiere Elements 10 for those purposes. When working with larger photo and video files, the sparse RAM configuration becomes an issue and performance suffers. The Spectre XT is available for between 1530 to 1600 Euros (~$2050 to ~$2150). Other models are not available. 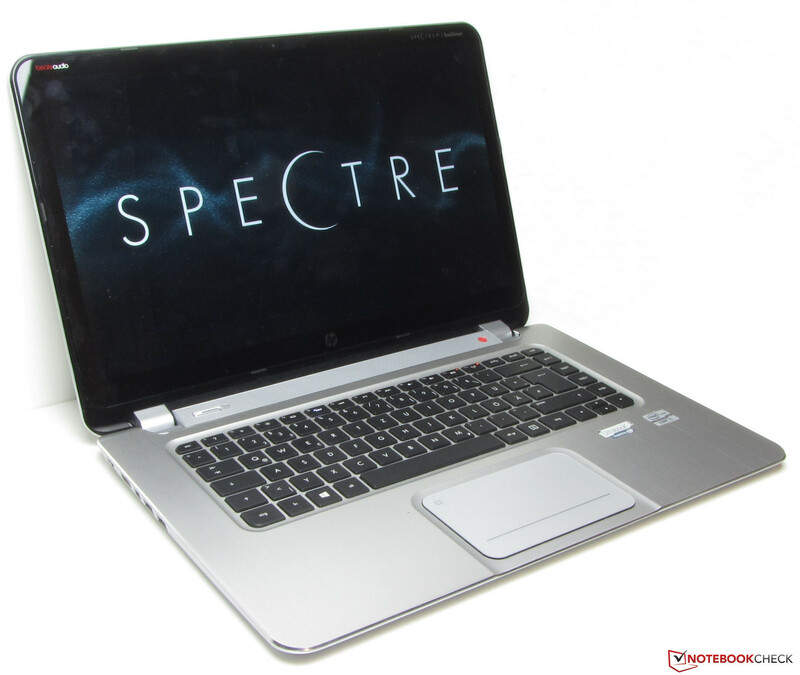 The Spectre XT comes equipped with an Intel Core i5-3317U. This ULV CPU operates at a lower voltage and thus requires less power. The dual-core processor is part of Intel's Ivy Bridge series and features a base clock speed of 1.7 GHz. Turbo Boost can overclock the CPU to 2.4 GHz (both cores) or to 2.6 GHz (one core only). 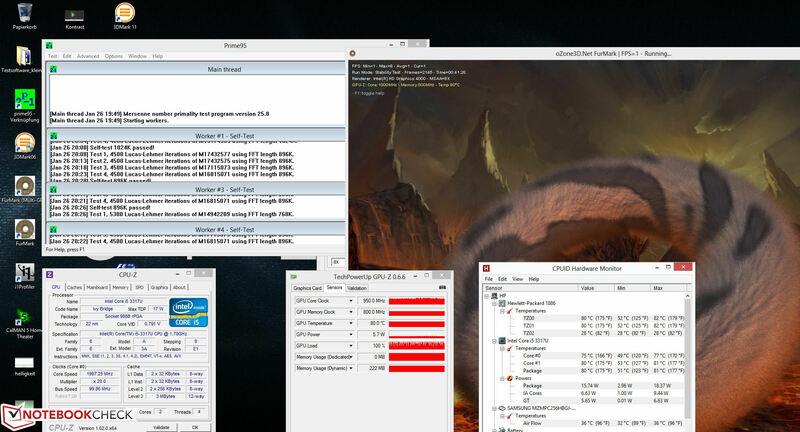 The processor executes the Cinebench benchmark tests at the maximum frequency. The results of the CPU and the GL Benchmarks are almost identical for both the Spectre XT and the Sony Vaio 13 - not surprising, since both Ultrabooks use the same CPU/GPU combination (Core i5-3317U, HD Graphics 4000). Asus's Ultrabook (Core i7-3517U, HD Graphics 4000) does slightly better - but both the UX51VZ and the Vaio S15 are about 3-4 times faster, since they are equipped with a standard processor. Because of their graphics cards (GeForce GT 650M and GT 640M, respectively), the UX51VZ and Vaio S15 have no problem winning the GPU test (OpenGL). Since the system is equipped with a solid state drive, overall performance is quite snappy and without lag. Windows 8 is fully booted after just a few seconds. The results of PC Mark 7 benchmark test confirm our positive impression. The Sony (Core i5-3317U, HD Graphics 4000) scores identical, the Asus Zenbook UX31A (Core i7-3517U, HD Graphics 4000) lower. Among the 15-inch notebooks, the UX51VZ and the MacBook Pro 15 Retina - both of which feature standard CPUs, strong graphics, and fast SSDs - end up on top. The 900X4C (HD 4000) trails behind. 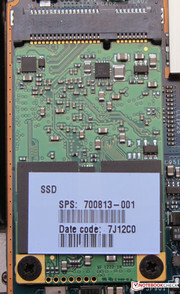 HP uses an mSATA Solid State Disk from Samsung (PM830) with a capacity of 256 GB. This is a very fast drive: we recorded a read speed of 471.15 MB/s and a write speed of 253.42 MB/s. 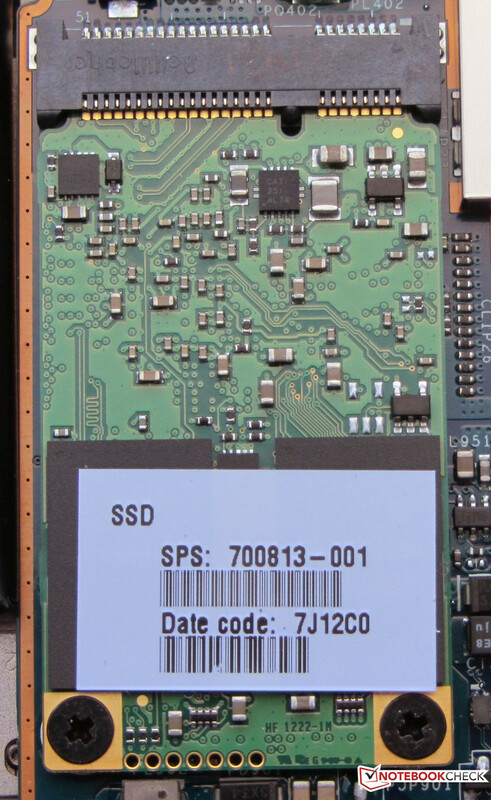 The solid state drives in the two competing notebooks offer similar read performance, but vastly different write speeds (Sony SSD: 87.83 MB/s; Asus SSD: 315.46 MB/s). We then ran the 4K read test on AS SSD and recorded 17.86 MB/s for the Samsung SSD - a good value. Data is frequently stored in 4 kB blocks, so this is an important indicator. For our comparison below, we also included notebooks with other solid state disks. A positive standout (read performance): the UX51VZ with two SSDs. As far as the 4K reads are concerned, the UX51VZ offers performance on par with the Spectre. The Spectre uses the integrated Intel HD Graphics 4000 GPU, which supports DirectX 11 and operates between 350 and 1050 MHz. The 3D Mark performance scores are as expected. The Sony Ultrabook (Core i5-3317U, HD Graphics 4000) offers the same performance, since it is equipped with the same CPU/GPU combination. The Asus Zenbook (Core i7-3517U, HD Graphics 4000) outperforms the 13-inch competitors when tasked with the 3D Mark 06 benchmark test, since it has a faster CPU and RAM operating in dual channel mode. The HD Graphics 4000 included with the Core i7 processor series is also 100 MHz faster. Of course: none of the integrated solutions can compare to the dedicated GPUs GT 650M (13201 points 3DMark 6) and GT 640M LE (8850 points). The Spectre XT doesn't really have a potent enough GPU to handle the current crop of games - even though it can handle some 3D games with the details and resolution set to low. A few of the less demanding games, like the FIFA series, should also run adequately at 1366x768 and medium details. The frame rates would increase by 10-20 percent if the RAM was running in dual channel mode. For around 1500 Euros (~$2000), other systems offer much better gaming performance - for example the UX51VZ running Anno 2070. During idle, the Spectre emits between 29.6 and 35.9 dB (A). The fan turns off completely at times, but the upper value of 35.9 dB (A) is too high for a notebook with ULV hardware. 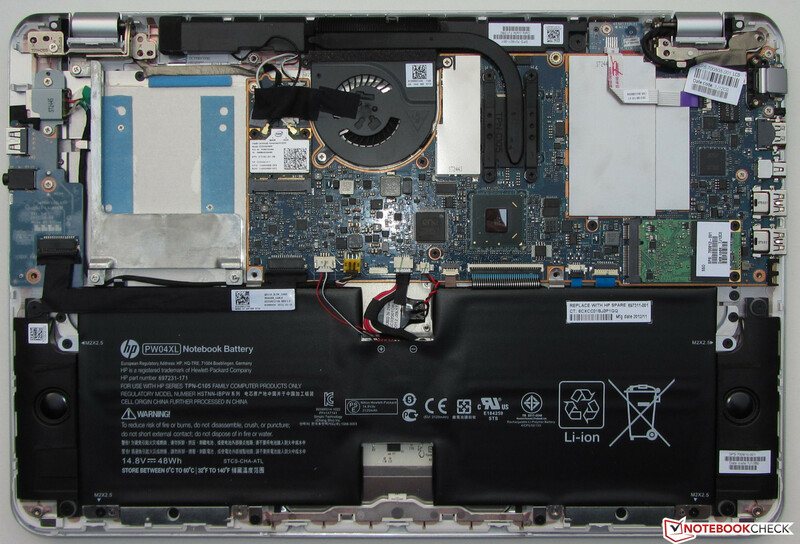 The Sony notebook (31.1 - 34.4 dB (A)) is about as loud as our review system; the Asus Zenbook (29.5 - 30.3 dB (A)) on the other hand shows what a well-designed cooling system is capable of. Subjected to medium load levels (3D Mark 06), the Spectre XT reaches 35.2 dB (A). Both the Sony Ultrabook (38 dB (A)) and the Asus Zenbook (38.3 dB (A)) get a bit louder in this scenario. When we ran our stress test (Prime95 and FurMark), the HP topped out at a fairly high 44.2 dB (A). The Sony (38.5 dB (A)) and the Asus (40.5 dB (A)) are quite a bit less noisy. HP Spectre XT during the stress test. The temperatures of the Spectre XT are well controlled during idle - we measured between 25 and 33.6 degrees Celsius (77 and 92.48 degrees Fahrenheit). Under full load, the temperatures increase to between 25.2 and 42.2 degrees Celsius (77.36 and 107.96 degrees Fahrenheit). Only above and below the cooling vent we measured in excess of 40 degrees Celsius (104 degrees Fahrenheit) - this means that the notebook can be used on the lap safely under pretty much all load scenarios. The palm rest only gets moderately warm (up to 30 degrees Celsius / 86 degrees Fahrenheit). The Asus Zenbook gets warmer across the board and reaches 50 degrees Celsius (122 degrees Fahrenheit) in some spots. The Sony Ultrabook runs a tad cooler than the Spectre XT. During the stress test (Prime 95 and FurMark running in parallel at least for one hour), the CPU maintains 2 GHz for about 10 minutes when the notebook is plugged in. After that, the clock speed fluctuates between 2.1 GHz on the high and 1.8/1.9 GHz on the low end. The GPU frequency remains at 1050 MHz for about 25 minutes and then hovers between 950 and 1050 MHz. When we ran the stress test while the notebook was running on battery power, both the CPU (2.0-2.2 GHz) and the GPU (900-1050 MHz) operated at varying frequencies from the start. After the stress test, we repeated the 3D Mark 06 Benchmark test: the result is the same (no difference between a hot and a cold notebook). 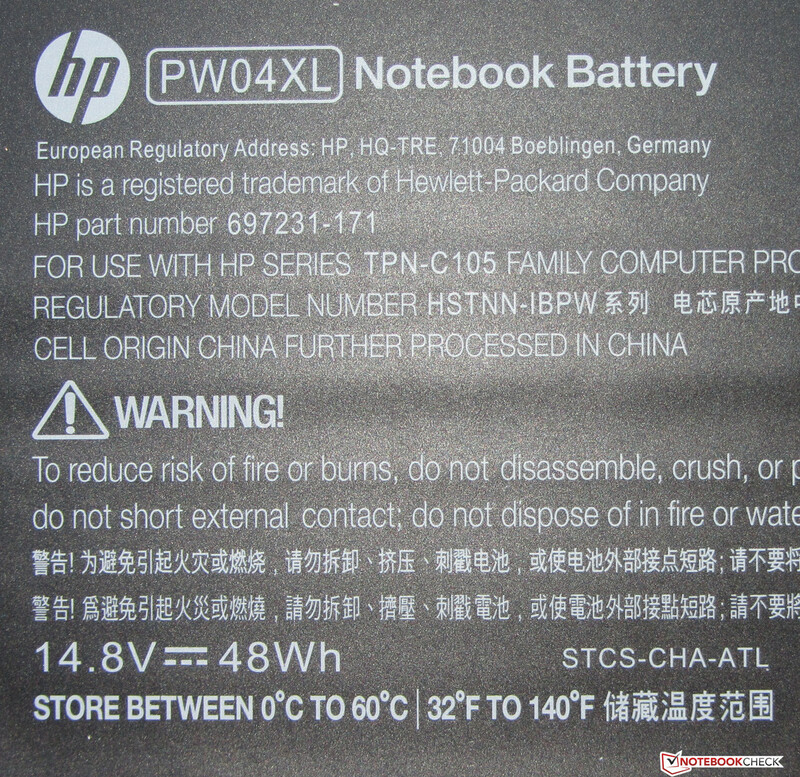 The CPU temperature levels off at about 80 degrees Celsius (176 degrees Fahrenheit) when the notebook is plugged into external power. (+) In idle usage, the average temperature for the upper side is 28.9 °C / 84 F, compared to the device average of 29.4 °C / 85 F.
The Spectre XT is equipped with a "Beats Audio" sound system. 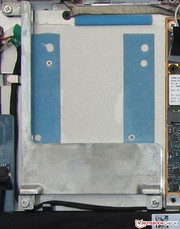 HP managed to incorporate four speakers into the thin chassis: two on the bottom, the other two behind a speaker grill above the keyboard. The speakers sound quite decent, albeit somewhat tinny at times. The maximum volume is pretty loud and the spoken word is easy to understand. 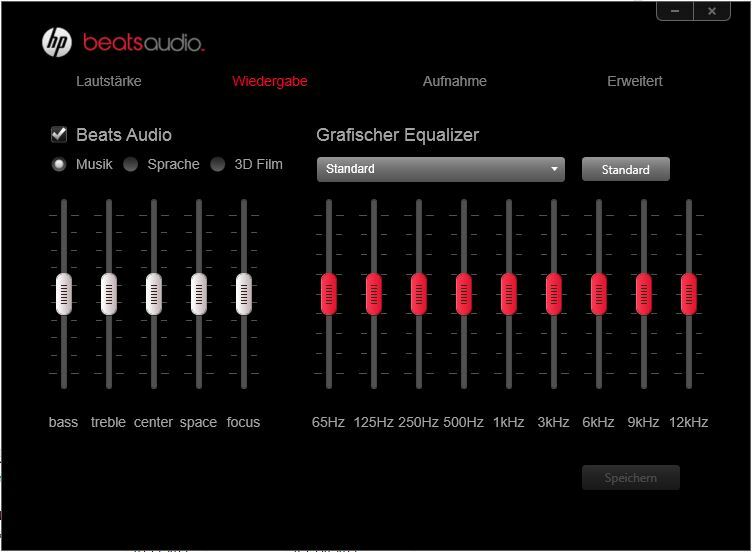 The Beats Audio Software allows the user to modify the sound to his or her liking. Those wanting even better sound can always use external speakers or headphones. During idle, the HP Spectre XT consumes between 8.3 and 16.9 Watts - comparatively high for an Ultrabook with ULV hardware - the better equipped HP Envy dv6-7202eg, (which does not have a ULV CPU), doesn't need any more power. 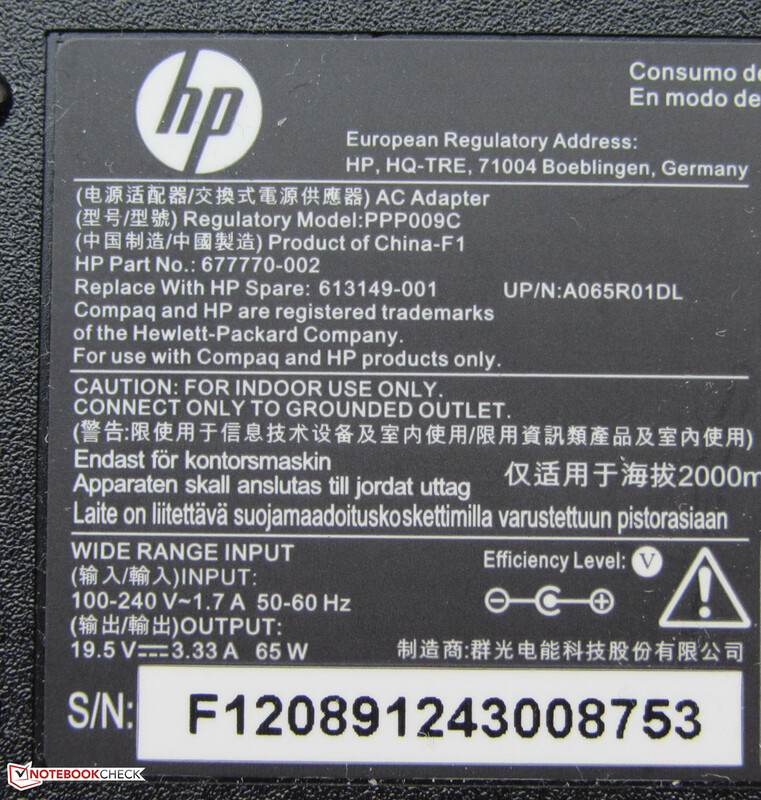 A possible explanation could be the type of display panel that HP uses in the different notebooks. Under medium load scenarios (3D Mark 2006), the Sony Vaio (27 Watts) consumes the least amount of power; the Spectre XT (34.5 Watts) and the Zenbook (38.8 Watts) need slightly more. When power consumption is pushed to the limit (Prime95 and FurMark together), the order remains the same (Sony: 33.9 Watts, HP: 37.8 Watts, Asus: 40.1 Watts). The standard CPUs used in the UX51VZ and Vaio SV-S1511X9E consume a lot more power: 74-90 and 43-49 Watts, respectively. During idle, the notebook only lasted 6 hours and 24 minutes. The smaller 13-inch models did much better: we recorded 9 hours 17 minutes for the Sony T13 and 8 hours and 58 minutes for the Asus UX31A. To measure idle performance, we use the Battery Eater Reader’s Test: the display brightness is turned down all the way, the power-savings profile is enabled, and all wireless modules are turned off. Under load, one charge provides enough power for a run time of one hour 19 minutes. The Sony Vaio (3 hours 12 minutes) and the UX31A (2 hours 25 minutes) outlast our review model by a fair margin yet again. For the load test, we use the Battery Eater Classic Test. For this test, the screen brightness is turned up all the way, the maximum performance profile is enabled, and all wireless modules are on. The Spectre XT lasted 3 hours 34 minutes during the WLAN test - again much worse than the competition (Sony: 5 hours 50 minutes, Asus: 4 hours 20 minutes). For this test, a script automatically cycles through websites every 40 seconds. The power-savings profile is enabled and the display brightness is set to 150 cd/m². One might think that the 15-inch systems don't last nearly as long since they have power-hungry graphics cards - but that is not correct: we recorded 5 hours 17 minutes for the UX51VZ, 4 hours 34 minutes for the SV-S1511X9E, 7 hours 13 minutes for the 900X4C, and 6 hours 4 minutes for the MacBook Pro 15 Retina. The 15-inch Zenbook, equipped with a GT 650M and a quad-core processor, also outlasts our low-voltage review model - but comes with a much larger 70 Wh battery. We find the battery life of the Spectre XT to be pretty disappointing. After all: this is an Ultrabook with ULV hardware - it's reasonable to expect run times that are at least 1 to 2 hours longer. The 13-inch competition features similarly-sized batteries (HP: 48 Wh, Sony: 45 Wh, Asus: 50 Wh). 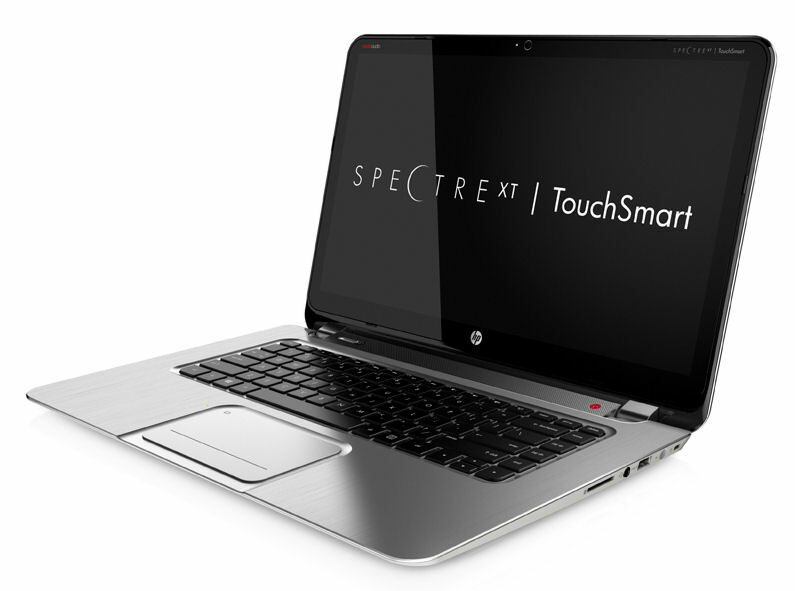 The Hewlett Packard Spectre XT TouchSmart is a visually pleasing Ultrabook made from premium materials. We like the sturdy chassis, the software package, the very good display with its high contrast, and the fast Solid State Disk. The touchscreen works flawlessly, but is more of a gimmick in our opinion. Not everything is perfect: HP doesn't use dual channel RAM, which limits the performance of CPU and GPU a bit. Additionally, the battery life is not very good for an Ultrabook. Considering the price of 1600 Euros (~$2150), those are pretty serious flaws. If a good matte display and better performance are more important than the touchscreen, the Zenbook UX51VZ or the Vaio SV-S1511X9E are worth a look. The GPUs in these notebooks can handle the current crop of games, the battery life is actually better, and the processors are more powerful - all for about the same price. The Samsung 900X4C does not have a dedicated GPU, but features a matte PLS display, lower weight, and very good battery life (7 hours 13 minutes). The MacBook Pro 15 Retina (6 hours 4 minutes) also features a powerful GT 650M GPU, but is expensive due to the Retina display (1950 Euros / ~$2600). The Asus Zenbook UX31A (13-inch display) should appeal to those users who are happy with ULV performance, but would prefer a touchscreen and a premium chassis. Because of the smaller screen, the Zenbook is also easier to carry around. The price is also comparable. The Sony Vaio SV-T1312V1ES is a good choice when the price is of the utmost importance, but the display quality isn't. The battery is easy to swap and the RAM is simple to upgrade. The street price of the Sony Ultrabook is around 800 Euros (~$1080) at the time of this writing. 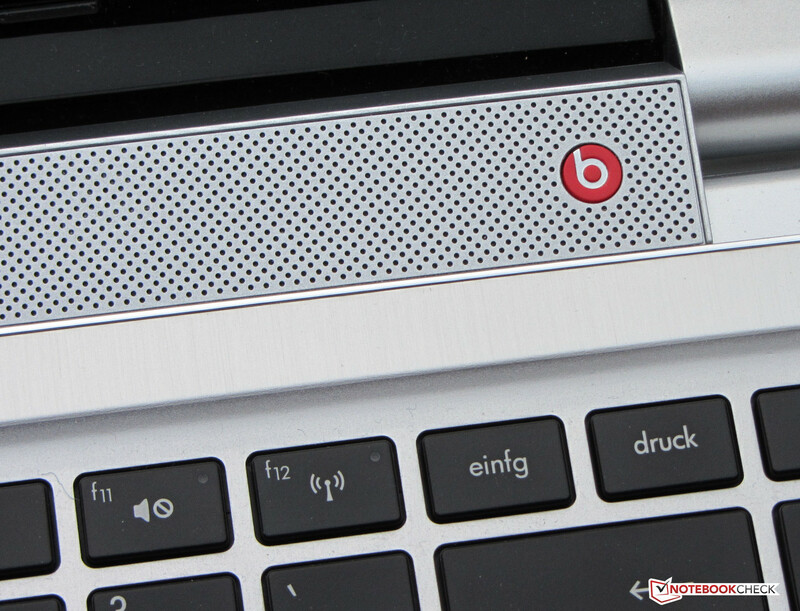 The Beats Audio software allows the user to adjust the sound of the speakers to his or her liking. The battery is secured with a few screws. The capacity is 48 Wh. The pouch for the power adapter. No more accessories are included. The Spectre XT TouchSmart outdoors. Norton Internet Security protects the notebook. The hinges hold the display lid in any position. The RAM is covered by a heat shield. One slot is open; to the right side there is the RAM the Spectre ships with (soldered onto the motherboard). 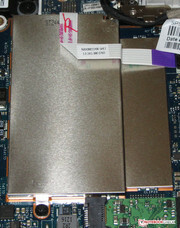 HP uses a mSATA Solid State Disk. There is also a spot for a normal hard drive. The fan system is accessible for cleanings. 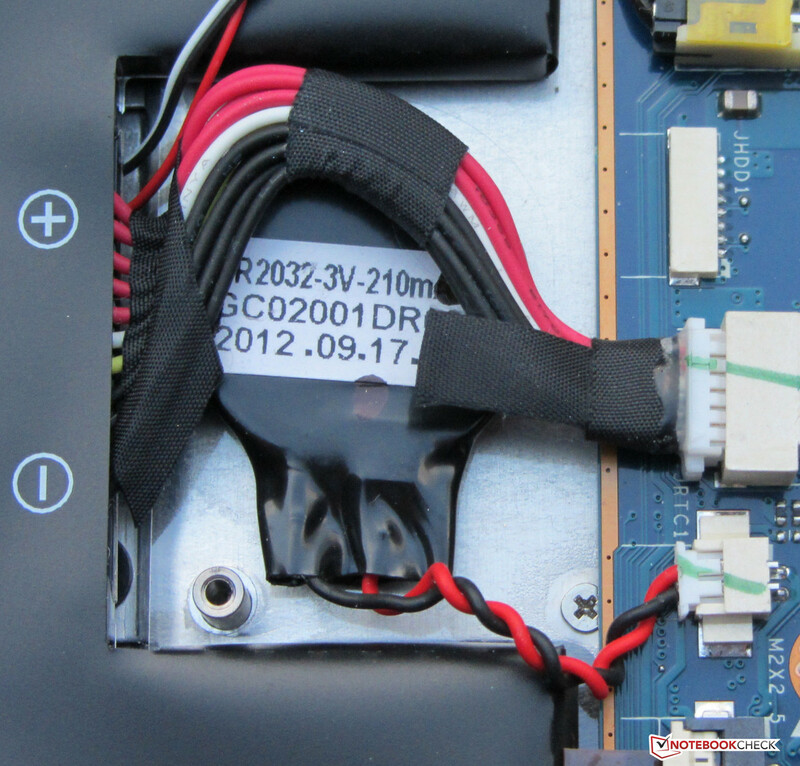 The BIOS battery is also accessible. 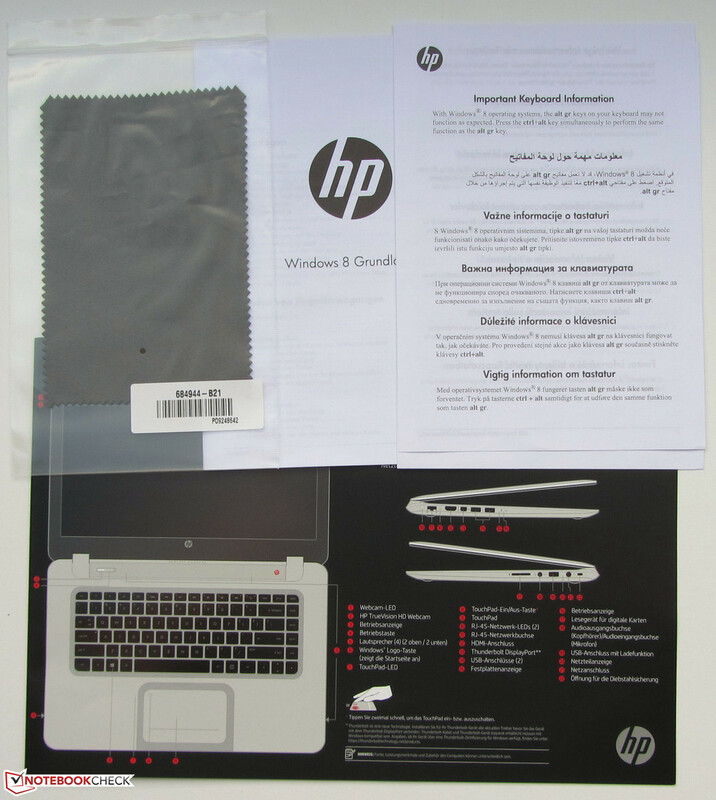 HP includes the photo editing software Photoshop Elements 10. The great display with excellent contrast, the pleasing design. A much better battery life. The Spectre XT TouchSmart's battery life equals that of some notebooks retailing for 400 Euros (~$540).